The eyes of the late president gaze out from buildings and streets in cities throughout the nation, a constant reminder of his outsized political legacy. 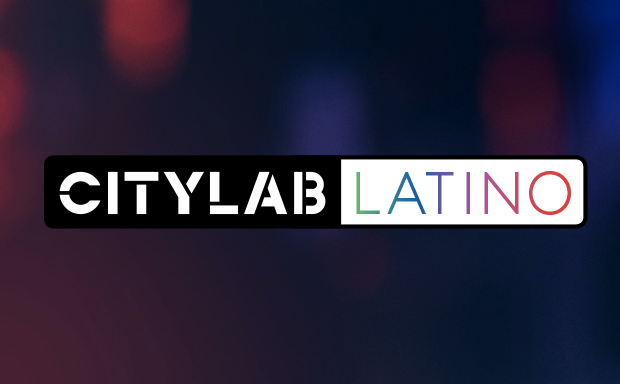 This article also appears in Spanish on our sister site, CityLab Latino. Almost four years after the death of Hugo Chávez, he continues to watch over Venezuela’s capital. The eyes of the former president have become political propaganda. An abstracted image of them is spreading across Caracas, especially in the Gran Misión Vivienda Venezuela (GMVV), a massive public-housing initiative begun in 2011 for those affected by the heavy rains that hit the country that year. The motif was born during the 2012 presidential campaign, the idea of a member of Chávez’s campaign organization named José Miguel España. Since then, as life in Venezuela has become increasingly fragile, the image has become an important tool for Chávez’s embattled successor, Nicolás Maduro. After Maduro came to power in 2013, the eyes started appearing not just on t-shirts, flags, and banners, but on the fabric of the city itself—billboards, walls, and even the facades of public buildings. This provoked a political spat last April. The new executive committee of the National Assembly—the country’s legislative body, led by the opposition party—removed the eyes that had been painted on the Assembly building in central Caracas. A government minister retaliated by asking muralists “to paint against censorship,” spurring the appearance of the image on other prominent buildings. The people he was calling on are known as muralistas de la patria or “muralists of the motherland,” who work for the government, painting political messages on walls. Already, the image is a symbol of the Bolivarian revolution, for both supporters and detractors. “For me, the eyes represent the urbanism of peace that our commander [Chávez] wanted in life,” says Reyna, who declines to give her last name for fear of reprisals. She lives and works as a social worker in the Caracas parish of Macarao, where the government has built 26 towers with more than 4,000 apartments and some 52 emblems of the former president. Others, like María, who lives in the Baruta municipality of Caracas, view the propaganda as “part of the same demagoguery.” For her, the eyes are another mechanism of oppression. María also declined to give her full name. Venezuela is in economic crisis. Its inflation rate has hit triple digits and food and medicine are in short supply. Last summer, as the situation worsened, Maduro directed the military to take over food production and distribution, as well as major ports. In recent days, his government held a mass military drill and had political opponents arrested. Whether or not Maduro fulfills his promise to build 3 million units of public housing by 2019—meaning more canvases for more pairs of eyes—all over Venezuela, Chávez seems to contemplate the country as it goes through one of the most troubled periods of its history. Teresa García is an architect and freelance writer pursuing a Ph.D. in urban design with a special focus on divided cities.